Design personalized holiday cards this year using photos or even your own artwork. Our customized greetings are a great way to wish everyone all the best this holiday. Forego the trip to the local drug store to look for the perfect card. Create your own that features your most treasured moments for a greeting that comes from the heart. 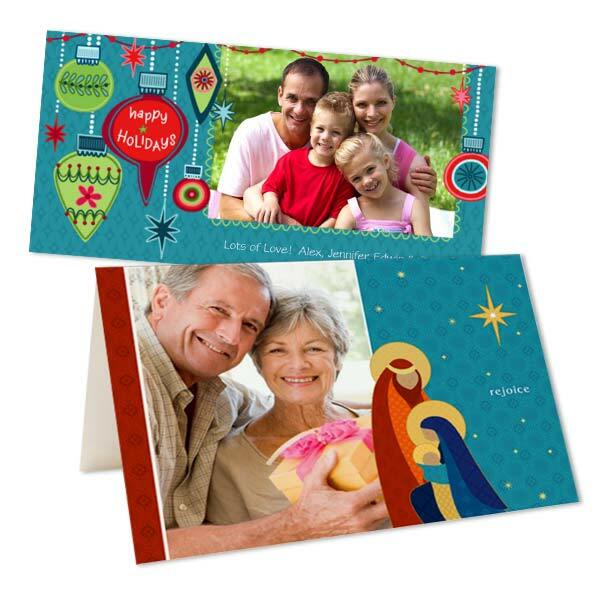 Make photo Christmas cards to send out to all your loved ones. Use your favorite family portrait to design Chanukah cards. Or, even make New Year’s party invitations. We have stylish card templates available for every festive occasion! Speaking of card templates, we have a wide selection to choose from in an array of styles. Go traditional or select a modern, elegant template to make a statement. If you’re looking for classic cardstock cards, we offer double sided photo cards and folding greetings cards that are printed on heavy weight paper for a professional look. Our glossy photo paper greetings are perfect if you’re looking for cheap photo cards printed to the highest quality standards! If you’ve been intending to print photos from your phone, why not use them create one-of-a-kind greetings to share with friends and family!